This is a little speaking game I made... my love of burgers and ESL combined! lol. I hope you can use it in your classes. You can change the conversation questions for any level or topic you'd like. For me, I am using this as an after school English class warm up, so I am asking some random questions to get the kids talking. I could happily use this for adults as well. First, show them the title slide and how to play, then the burger table. I would demonstrate the game instead of reading out the instructions, they're really just there for the teacher. Second, get your class into 2 teams. You can play with uneven sized teams, 2 teams of only 1 pupil, whatever you'd like. It's not a biggy. Next, get them to roll 2 dice. The first dice should indicate the question out of 5 questions (on the right side of the burger table) the student should answer. If they roll a 6 they can pick any question. The second roll, indicates the burger ingredient they get. 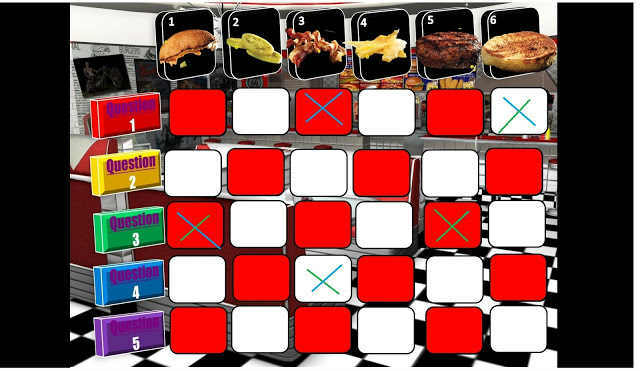 The object of this speaking game is to see which team makes a complete burger first. You will be required to mark the table by using a white board marker. I'd do a different color pen for each team or if you can't mark, use a magnet or sticky notes. The burger ingredients are numbered 1-6 to match the 6 sides of the dice. If they roll the same combination after already marking it on the table, they have to repeat the same question. That's fine especially when you play in teams as different students will roll and be able to answer the same question but obviously, with their own answer -as the questions are conversational no right or wrong answers, so to speak. You can download this PowerPoint from my teachers pay teachers page, for free! As you can see the question box, when pushed hyperlinks to the question slide. Click when you arrive there and the food tray with the question will appear. After answering, click the green arrow to return to the burger table slide. Once again, you can easily edit the questions to new conversation questions and re-use this warm up again and again. Happy Teaching!